Gold is one of important parts of protection for financial independence. A website visitor inquired with the question to show him gold mines that will sell gold in large quantities and that want to sell gold through bank contracts or by CIF. First I have opened gold trading in Europe, and later moved to Africa with investments. I have myself company in Uganda and in Tanzania. The report tells the foreign investor how easily gold can be sold in Ghana, without effort and for cash on the spot, no questions asked, for almost spot prices on the market. 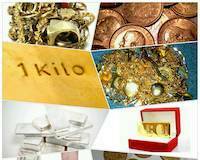 My girlfriend or wife has troubles and wish to sell the gold in Ghana? Can you help me? She has got a gift from someone, but just need to pay some 10,000 pounds or dollars, whatever, to release the gold so that she can export it. Can you help in exporting gold? My wife has some gold in Ghana, please help us sell the gold in Ghana. Often there are security companies involved and inheritance of gold.